RESISTANCE – the concept created by ULTRA Worldwide that debuted in Buenos Aires just 18 months ago – will officially become a standalone event series with the launch of RESISTANCE Peru. 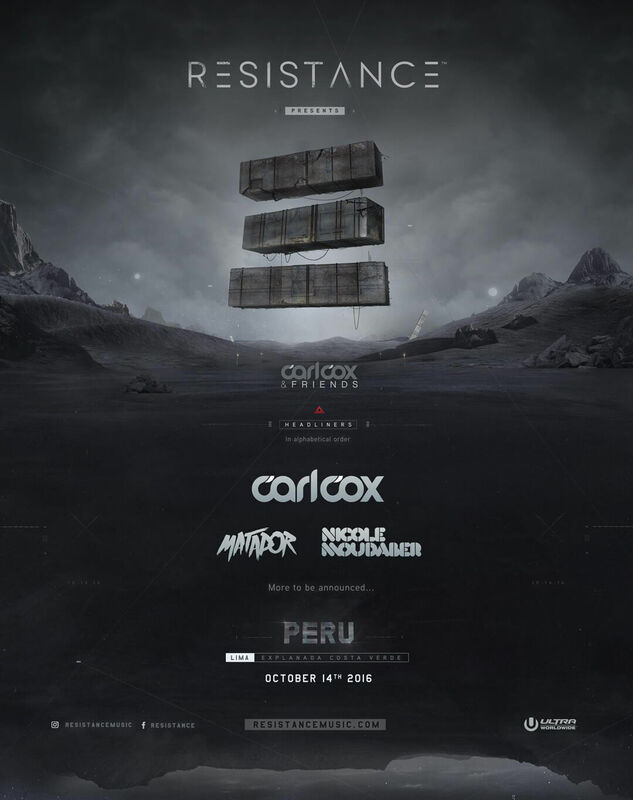 Launching in conjunction with Carl Cox & Friends, the debut RESISTANCE Peru will run this October 14, and will mark the very first time ULTRA Worldwide has EVER run an event outside of their renowned ULTRA brand. In addition to the king himself performing, the inaugural edition of RESISTANCE Peru will feature some of the most respected acts in the scene including Nicole Moudaber and Matador with more to be announced, and will take place at the stunning Explanada Costa Verde site with a brand new stage production created specifically for the show by the Ultra Music Festival creative team. Forever at the forefront of the global expansion festival and event scene, ULTRA Worldwide has brought the very best in techno music direct to the doorstep of fans across five continents through RESISTANCE, and with RESISTANCE Peru, they will once again lay down a marker as one of, if not THE most versatile producers of electronic music events today. Before reaching the shores of Lima, the RESISTANCE worldwide takeover will run through Asia. 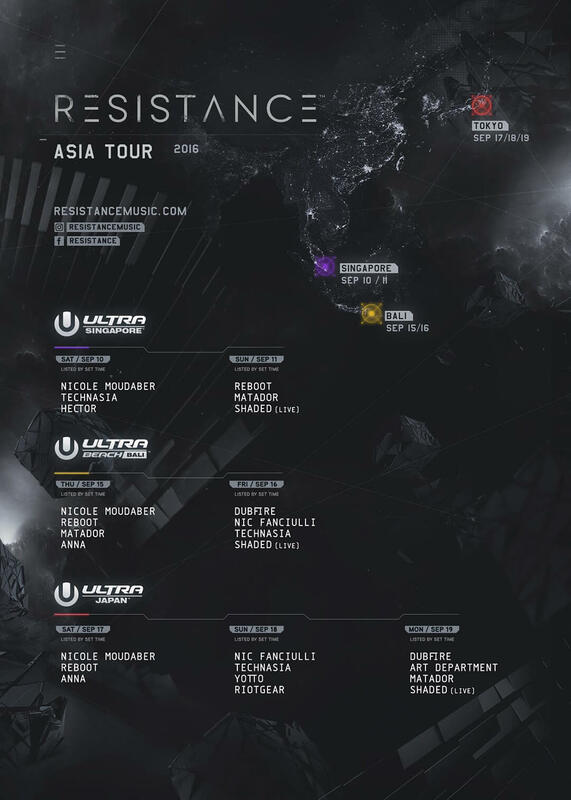 With six ULTRA events taking place on the continent this September, RESISTANCE will be present at three of them in Singapore, Bali and Tokyo with Dubfire, Nic Fanciulli, Nicole Moudaber, Art Department, Reboot, Matador, Technasia, Shaded (live), Hector, Yotto and RioTGeaR just some of those set to perform. ULTRA Brasil have also released their initial RESISTANCE lineup for their first edition in Rio de Janeiro this October, with Carl Cox, Hot Since 82, Matador and Anna featuring in the Phase One announcement. More names will be released shortly in conjunction with the Ultra Brasil Phase 2 artist announcement, but for now you can plan on the Saturday lineup to run in partnership with the Carl Cox & Friends phenomenon. Now is the time to join the RESISTANCE. For more information on all RESISTANCE events, visit resistancemusic.com. See below for the current RESISTANCE lineups worldwide, with more names to be confirmed soon for certain dates. A unique concept pioneered by ULTRA Worldwide in 2015, RESISTANCE™ has fast become known for producing some of the highest quality house and techno experiences around the world. First witnessed at ULTRA Buenos Aires in February 2015, receiving rapturous responses from fans and critics alike, the concept was then rolled out at the flagship Ultra Music Festival Miami the very same year. Housed in the awe-inspiring, state-of-the-art ‘Afterburner’ stage, powered by UK production company Arcadia Spectacular, the RESISTANCE™ concept drew huge international attention and recognition in Miami and has since had custom productions on five continents, including a subsequent show with the ‘Afterburner’ at Ultra Europe 2015. ULTRA Music Festival 2016 saw RESISTANCE™ team up with Arcadia Spectacular once again, this time for the highly anticipated North American debut of the legendary ‘SPIDER’ structure, complete with its own breathtaking ‘Arcadia Landing Show.’ In only its second year, the burgeoning RESISTANCE™ concept continues to expand at breakneck speed, introducing newcomers and avid fans alike to the very finest realms of house, techno and everything in between.